A Network Admin/Web Development Student at Alfred State Sharing thoughts about stocks to invest in and other random oddities. Many of you may have trouble remembering that password for your much needed email or instant messenger sign on. Well I've got the solution for you! When naming your pet use 8 or characters! Fido, spike, popo, and bob just isn't cutting it. here Bacardi03, here Freakonomics, heel Thunderkitten! While I love Bush for his capital gains tax cuts I still think that there should be a cap on them so that annoying top 1% of the population can still get taxed like they should. 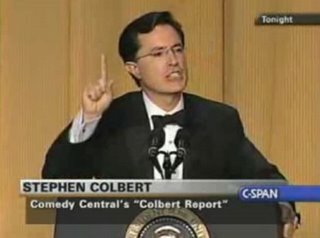 Anyway I found a nice clip of Bush getting Roasted by Stephen Colbert. Apparently Bush has a new White-House information spinner. I need one of those guys to come up with excuses for not having my homework in on time. AOOR got a inflow of about 400,000 shares in early trading yesterday and jacked up the price about 13% and set off one of my limit orders. My position in AOOR gained 10% in under 2 weeks, not too shabby for a junk company worth nothing but speculation on Biodiesel. Bush's mentioning of Biodiesel yesterday happened to be pretty in sync with the jump. I wouldn't be surprised if there was a rundown in AOOR's price and may re enter somewhere below 62 cents/share and wait for te next jump when Willie Nelson does his Biodiesel PR. PTSC still has alot of potential under its wing. their patent portfolio has cash cow potential, which in a company which consists of 6 people that overpay themselves and various lawyers, can lead to plenty of profits. They announced in a PR Newswire Monday which included share buyback with future revenues. PTSC's Patent Portfolio is like Rambus on a smaller scale. and what P/E is Rambus Trading at? 127! imagine PTSC win's their court case down in texas against the Japanese companies. Fujitsu already rolled over and cut a deal, Intel and AMD have already paid up, and AMD even owns shares. I'm actually considering buying back what I sold at 1.17 if it drops below 1.10 sometime before the Share Holder's Meeting this Friday. The only complaint is that some Brokerage's haven't been that good at distributing PTSC's dividend, namely the TD Waterhouse section of AMTD. Their recent merger will cut down on costs eventually but its just a sign that they have some kinks to work out. Even though they doubled their profit for Q1 '06 vs Q1 '05 their flat trading expenses pushed down their 2007 expectations. The one thing is these expectations don't factor in new and retained customers as a result of cheaper trading costs. I still would shrug this stock off if it weren't for the Insider Buying going on, which is generally the best indicator of future growth you can get. So AMTD is a buy In humble opinion, easy 2 dollar upside if you can pick it up below $19.50, but prepare for a bumpy ride cause the bears have been all over it since their earnings call. I happen to have a decent position leveraged on Gold, I took a small piece of it off the table (about 6.7%) which happened to have a 11% gain. While I still think gold has plenty of upside along with most of the metals, nothing wrong with taking a little profit. The game is on! Do you have what it takes to drive away in a very sweet 400HP, limited production 2006 Maserati GranSport? We're spotting you a cool million in Squawk Bucks to invest now through May 26th. You buy, sell or hold the stocks of your choice. You can even add valuable Bonus Bucks to your portfolio by watching Squawk Box, and correctly answering our daily Bonus Bucks question.We've always known Squawk was valuable - but now it can really give you the racer's edge! On May 26th, game over. Richest player wins! Top 25 also-rans get cool tech toys just because we're nice. So...you in? I've been in this since the beginning, but since all my good idea's this month have been in the OTC BB market i've been somewhat limited. I did make about 2.5% quick on Rite-Aid and then dumped all my play money into CNXT after it got dragged down on bad earnings by Bookham. now with conexant I might have the worth up to 1.1 million, still about 300,000 off from the top 50. But its worth a try, and you can get an extra $2,000 fantasy dollars if you answer the daily question right. I"ll give you a hint for today's answer, it's not Amgen or Genentech. I do pretty good considering I'm always in class whenever the question comes up, but get one lucky pick and ya never know. Our EGLY could have another huge day tomorrow! News came out after the close today that they passed the evaluation of Abercrombie & Fitch's Product Quality Standard to become its producer. EGLY already signed production orders through an agent for Abercrombie & Fitch worth over $500,000. My firm Lebed Biz, LLC, has been compensated by a third-party (John Zanic) $25,000 cash for a one-month EGLY investor relations contract. Never invest into a stock we discuss unless you can afford to lose your entire investment. I love that, $25,000 to recommending a stock. While Lebed is legitimate sometimes at least he's pointing out what he's pumping. Turns out lebed was some child stock prodigy, I don't have anything against him, actually I just subscribed to his newsletter. But watch for the pump and dump. YHOO more than beat my expectations, I thought the bears would be all over it still but it managed to gain 2 and a quarter. PTSC went nuts today, being it was completely oversold 2 days ago. and gained 34.88% today... The thing is, the more I look at it my crazy self thinks its still got more upside, so I'm going to sit tight and enjoy the roller coaster ride (I bought it with unsettled funds so can't sell it anyway). AOOR took a small hit today, as I expected, but it may start movin up to the .90's soon. Its subsidary's got some nice free PR again today thanks to good ol "BioWillie" and they filed their SEC paperwork saying that they do own a good amount of EBOF's outstanding shares. I think YHOO did decent, not great but decent, enough to kill its current undervaluation. After market and pre market trading has it up 3-7%, I think it should at elast close at $32 or above today conservatively. One small step in its way up to $37 / share. Meanwhile UNH is continuing to get slaughtered. whats so wrong with them stopping executive options? means more money for the company as far as I'm concerned. and they shouldnt have done anything eilleagal since rules weren't implemented until 2002. But meanwhile S&P drops it to a $57 target (they're always conservative) and a hold rating from a buy. and the Goldman analyst is probably working with a short seller that wants UNH to goto $48. Till then I'll just have the rest of my money working for me while my UNH and Tribune shares continue to bottom. I'm still going for my 12% goal. and while I'm there almost with realized gains, I'm still not going to take a loss on UNH. Its trading like it has 5% growth when it will be having 15% growth in 2007. I think PTSC undervalued at anything under $1 / share. They have a nice patent portfolio that happens to apply to many multiprocessors that are infringing. They have notified over 150 major companies of such possible infringement and every time they win they get millions thrown at them. its already trading up today in german markets on light volume but I see a possible 10-20% upside from its current value. Dare I sat $1.17 by next friday? I think I dare. I reduced my position in AOOR, netting a easy 10% gain on what I sold. But since they hadn't filed a SEC 10-k in 5 months I decided to reduce my position. Their subsidary did end up releasing decent numbers. I think EBOF.ob is still overvalued and AOOR is the best way to play it. Although if AOOR.ob doesn't file today they may face a delisting and may drop down to its moving average which is around 49-51 cents / share. UNH had some good numbers, actually about 3% better than I expected. I was shooting for an 18% increase in profits and they got 21%. you can read more of their earnings here. From the looks of it they'll open up 2-3.5% from pre market trading, which will be nice considering I'm down a couple hundred bucks in my currrent poition. Deutsche Bank maintained a "buy" rating on the stock on April 16. "The market is clearly indicating its concerns over Yahoo! 's 2006 guidance," the firm said. "While we believe first-quarter results will be tight, we emphasize that Yahoo! 's upcoming search monetization initiatives and relationships with … advertisers continue to position Yahoo! for outperformance in 2006." I entered YHOO at $30. I'll be happy with earnings anywhere above $1 a share. If it misses earnings again I still agree with Deutsche Bank. but most analysts may not be happy unless they get $1.08/share. OK, so here's the story. Back in January when I bought up some UNH, which has since been killing me in unrealized losses, but I still bought it with conviction and stand by a $63.50 price target (I was planning on holding it till December anyway so I have a bit of risk tolerence)... oh yah anyway I wrote an email to Cramer about Health Care Reform and medicare/medicaid changes and got an email from one of his people on thursday asking if I'd be interested in calling in. Little did they realize I had write the intelligent email back in January but said they'd call me back at 3... I never heard from them... I still think the Audience Producer Paige is hawt though. Anyway I ended up calling up a very smart guy at AETNA and talking to him about automation and about how EHR's are desperately needed, as well as did some research and noticed a nice little bill being pushed through by the 11th district of Georgia Rep.
U.S. Congressman Phil Gingrey, M.D. today testified before the House Committee on Small Business, Subcommittee on Regulatory Reform and Oversight. Gingrey discussed H.R. 4641, the ADOPT HIT Act, legislation he introduced to encourage the adoption of Health Information Technology by increasing tax breaks for physicians who invest in new technology. The hearing was titled: Can Small Healthcare Groups Feasibly Adopt Electronic Medical Records Technology? Amend the Internal Revenue Code to increase the deduction allowed for the purchase of qualified health care information technology by health care professionals. More than double the first year deduction of rapid depreciation for qualified Health IT equipment from $100,000 to $250,000. Increase maximum purchase costs for qualifying equipment from $400,000 to $600,000 in any given year, allowing physicians to include other medical equipment purchases in the same year they purchase Health IT systems. BUT, even bigger news is the required mandate in MA callign for univeral Health Care. One of their main complaints was 100,000 people eligible for Medicaid that weren't enrolled. Yet had the gov't required EHR's the second someone became eligible they could be enrolled in 6 seconds. Small doctor's offices only have 12% implementation of EHR's, while in hospitals its a given that they'll be implemented, in offices with like a dozon or fewer doctor's it may not be very finacially viable, Gingry's proposal is a small step towards that. While HMO's were The Health Care Cost consolidation wave a while back, I think administrative costs are the next wave of cutting costs (they account for almost 25% of premiums). Since we can't really hire out of country immigrants to do this data entry and support we can only fire them and replace them with computers. Also that immgrant worker thing is the dumbest idea yet, the French are practically our enemy and we're trying to immitate their foreign worker policies, China is more forward thinking than them in globalization policies than the French. Anyway... buy UNH, and MDRX on weakness. Senators Barack Obama (D-IL) and Richard Lugar (R-IN) introduced the American Fuels Act of 2006 to the U.S. Senate last week, a bill designed to promote bio and alternative fuels in the hopes of reducing the nation’s dependence on foreign oil. The bill includes some interesting ideas, including an Alternative Diesel standard that requires 5-percent of the nation’s annual diesel pool be comprised of alternative diesels, a tax credit for automakers of $100 per flex-fuel vehicle produced, allowing the public access to alternative fueling stations on federal property and, this one’s a biggie, the establishment of the Office of Energy Security, complete with its own cabinet member, the Director of Energy Security. Meanwhile sugar is going crazy, Brazil, which creates ethanol from sugar and completely energy independant, has been getting an huge increase in demand. The scarcity of sugar is driving up prices of sugar on the commodities market and I don't think it'll slow down soon. I am now officially in Apollo Resources (AOOR), I am in this mainly for a trade based on speculation of the valuation of one of its subsidaries (EBOF). now goto EBOF and look at the market value, see that? its in the 50 millions.. why the hell should I be buying companies with interest in Bio Diesel (Which actually currently costs more than current diesel and wouldn't have a industry wide distribution of 70 million barrels if it weren't for Gov't subsidies) oh yah back to the point. Check out NASDAQ's quote of EBOF... notice there's a difference of about 350-400 million? thats where the money's going to be made, because AOOR will be reporting on their next SEC 10-k that they have around a 80% stake in EBOF, based on EBOF's valuation alone AOOR is worth 2-5x as much as it is now. This is higly speculative still and only for a short term trade in my opinion. If you must, try and get in at .65 or below. Alot of your central banks aren't dumping gold in huge amounts all at once, and rather keeping a controlled supply of it going, in fact some central banks are considering buying it! Scarcity of gold is growing by a small percentage and is pushing up gold, It may fluctuate down to $550 sometime during the year, but its hit the $600 mark alot sooner than I expected. Also I reaad over on another blog (I never can remember the links) about a little company called Apollo Resources (AOOR). Which alone isn't really worth much. but had a huge runup yesterday thanks to an announcement that it is disclosing the fact that it owns a sizable chunk of of Earth Biofuels Inc (EBOF) which happen to have Willie Nelson and Morgan Freeman on the board of Directors ... mostly for show... but let em think they're actually making a difference and get some free PR. I'd like to get in at around .60 /share but if I become eager may fork out .65 , either way if EBOF's value is true.... AOOR shares should be worth a little over a dollar up to $2.75/share by the end of '06 based on EBOF's valuation alone -Thanks to Allan for the betting opportunity, its like my days at the OTB, darn the gov for allowing OTB to reduce organized crime's hold on betting ponies! Well I been saying I liked YHOO and at $30.00 a share I picked up some. Last I checked it was up well over a quarter so far today so I'm into the black very easily, although I bought it last Friday on a limit order while I was busy playing video games. Also based on St. Patties day, I would give the advice of "Don't punch a New York state trooper", it will only lead to bad things and only ruins the party for the rest of us. By the way do you know who the US's biggest trading partner is? many may think its China.... But infact is Canada. I consumed alot of Labatts on St.Patties day and confirmed this. I've been watching Tribune as well, besides being a reliable dividend yielder, I think its cheap on a valuation basis if it drops below $29 a share. Although the media sector isn't the best out there I think this stock has taken a beating and besides paying a dividend should either get a 10% bounce back up (I Hope) or hit $31.50 - $32 sometime during the year. I'd prefer to see how it reacts once it gets closer to its 52 week low though. Invest at your own risk... TRB is a very small position in my portfolio. Also HAPPY 50th Post to me! Well, I can't say much... but I occassionally hear someone knows more than me, can't tell me what, but tells me to buy it. First I heard about Avanair around $3, would have given me a nice 33% gain. nice little company that is developing a drug for a disease that no one else has a drug for, or at least one that would be approved in the US market for years. although now its trading over at the AMEX. Hedge funds got into it at under $3. Got told about SFFS, apparently a guy that knows a guy that knows a guy said something was going on. Someone I know ended up dumping a good chunk into it as part of that, I can't disclose how much but then whaddya know, its announced Hudson City Bank is buying it out for at the time was about a 8-10% premium over what it was trading at at the time. So anyway was talking to a guy about UNH (Which is cheap as hell) and my most recent heard story is this little company called IONA, anyway apparently they got something in the pipeline and could possible cause a double. I don't like the fact that they risk a delisting from NASDAQ, although I think that their issue can be resolved, just some trouble with some people dieing at inconvenient times for reporting as far as I can see. I'm still looking into it, I don't like its current price levels and if I do get a position I'd prefer it under $3.50, if I find out what's really going on there I'll definietly get in. So what do I think of Yahoo! Well despite the fact that I was having trouble logging into Yahoo! finance today, I still am a strong believer in this company. their stock just recently hit a 52 week low...and I fear it may go even lower. I am actually considering dumping about 11% of my portfolio into this company at current levels. I've liked it at anything under $34.50 if I recall correctly, and think its going $37 by end of year, and if good news comes through it could spike as high as $45. believe it or not I think its a play on Japan. about 30% of its value I think is held in Yahoo Japan, which it has a 34% stake in. the rest of its value is based on its increased online growth mainly from ad revenue. considering Yahoo is having a growth rate of about 27-30% annually, unless it drops down to about 20% this stock is really undervalued. I am looking into buying this stock somewhere under $31 share. I'm waiting to see how it reacts considering its new 52 week low and for some reason see some people jumping ship and dragging it down another $1-$2 /share. By the way, march is dividend month for my portfolio, One of my better dividend yielders, BUD, I still think is buyable under $43/ share, although preferably somewhere around $41. Besides their growth in China, and Mexico (They own half of Corona) , the fact that you got Buffett behind it is reason enough to jump on for a long term position or perhaps a DRIP portfolio. I've mentioned before how much I hate this stock ever since I picked it up well above where I should have thanks to a market order I should have never placed Feb 15th of last year, it accounted for less than 5% of my portfolio and was just dragging me down. But I was confident I could wait it out and let the stock get back into the black. and today it finally did! I even went so far as to reccomend the stock when it was at $17 a while back. Today Cisco jumped 3.4 percent to $20.93 shortly before the company's chief operating officer was scheduled to speak at a Merrill Lynch conference. ok now get this, I made a whopping 34 cents off of this, that's right! Thirty four cents! (it was supposed to be 35 cents but Scottrade my broker was slightly off by a few thousands of a cent in the limit order and it cost me a penny. OK so I've been out partying and have had some little ebayer thinking he can scam me outta $300 on paypal, so havent really had time to catch my fav show Mad Money. but I found out today that Jim Cramer got this inquiry into stock manipulation of overstock.com OSTK . Which I seriously dont think you needed some hedge fund manager telling you to short the stock, a quick look at their eps and chart since Dec 04 is a representation of where this company is going. whenever I go shopping online I never see anytihng come up for their site, their marketing seems to be down the hole and their profit margins are possibly insufficent. I really dont like any of the online retailers as a whole, I'd still rather play the major delivery companies like UPS under $75 or FEDEX under par. Their surcharges for fuel and pushes for efficency in routes allow them to minimize additional costs brought on by fuel and random bombers in the arab nations and rebels in nigeria as well as exponential Asian and Indian Growth.